Synthetic biology describes the next generation of biotechnologies that attempt to engineer, re-design, re-edit and synthesize biological systems, including at the genetic level. Synthetic biology goes far beyond the first generation of ‘transgenic’ engineered organisms. Predicted to be almost a 40 billion dollar (US) market by 2020, industrial activity in synthetic biology is rapidly exploding as new genome editing tools and cheaper synthesis of DNA make it easier and faster to genetically re-design or alter biological organisms. Operational Definition. It’s time for the CBD to adopt an operational definition of synthetic biology. Precaution: Gene drives. Gene drives pose wide ecological and societal threats and should be placed under a moratorium. Biopiracy: Digital Sequences. Synthetic biology allows for digital theft and use of DNA sequences – this must be addressed by both the CBD and the Nagoya Protocol. Socio-economic Impacts: Sustainable Use. The CBD needs a process to address impacts of synthetic biology on sustainable use of biodiversity. Cartagena Protocol: Risk Assessment. 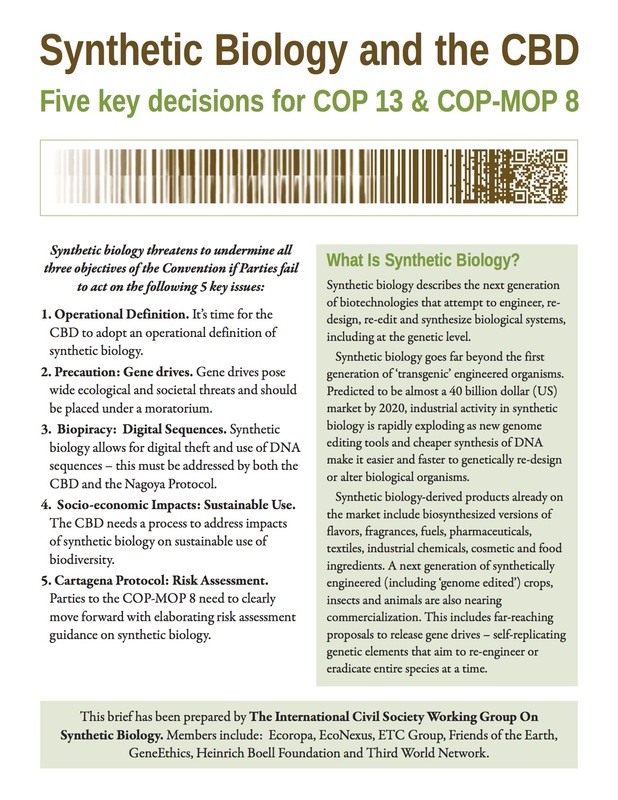 Parties to the COP-MOP 8 need to clearly move forward with elaborating risk assessment guidance on synthetic biology. Learn more -- download the English, Spanish, French or German versions here.